Here is an amazing vehicle “Amfibus” to integrate road ways and water ways. 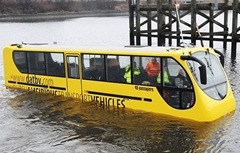 A two day demonstration of this amphibious bus was conducted on February 08 on the River Clyde in Scotland to evaluate the performance. The vehicle would operate on road as a coach (bus) from Braehead to the Renfrew ferry slipway. Then the same vehicle would operate as a ferry by using the existing slipway to reach Yoker by crossing the River Clyde. Thereafter it would reach Clydebank by road. The demonstration was conducted by Stagecoach Group, a leading international public transport group having extensive operations in the UK, United States and Canada. The vehicle Amfibus has already undergone trials in Rotterdam harbour, Netherlands. is 12.8 metre long, 2.55 metre wide and can carry 45 passengers. has Euro 5 engine and is built in Holland by Dutch Amphibious Transport Vehicles BV (DATV) of Nijmegen. has a hull on Volvo bus chassis that can float and is fully safety certified for operation on road and water by European transport regulatory authorities. on road: has a maximum road speed of 60 mph and operates like a standard coach with an accelerator and brake. in water: has a speed of 8 knots and is propelled by Hamilton, twin water jets controlled by a console on the armrest of the driver’s chair. The service is expected to be operational from end March. View some photographs of Amfibus from Flickr. Read more from Stagecoach Group and Dutch Amphibious Transport Vehicles.